This is a great icebreaker activity for your new classroom. Start out your day with giggles and fun! Draw a mixed-up character on sections of our R15406 Rolly Scrolly Paper, then unfold the entire thing to reveal a hilarious creation. This is a super easy activity for kids of all ages to try out! First, divide your class into groups of four. Students should each get one Rolly Scrolly to work on. 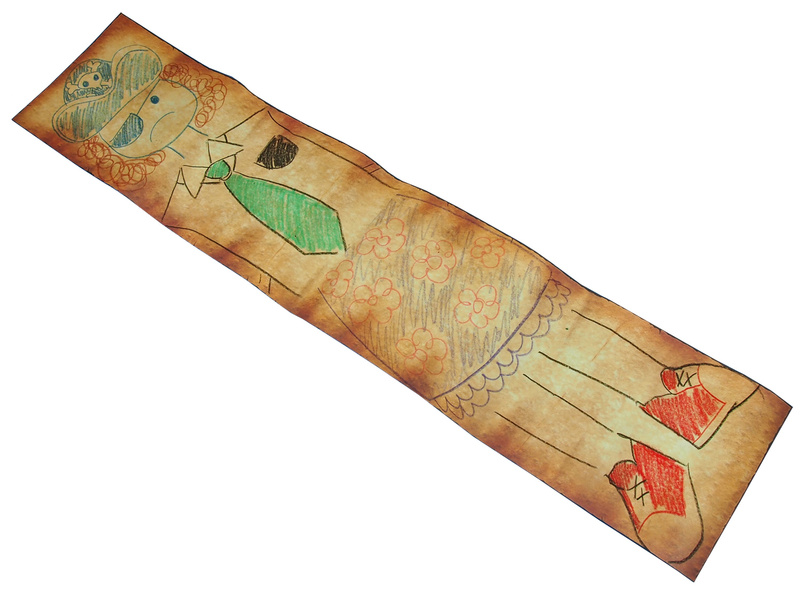 Show your students how to fold the Rolly Scrolly into four equal sections. To do this, first fold the entire Rolly Scrolly in half. Fold the Rolly Scrolly once more in half. You will need to rotate the Rolly Scrolly so that the fold line is at the bottom. The Rolly Scrolly has four sections. Each of these sections will make up parts of a character. Draw your character’s face on the first section. Draw a pirate, a princess, a firefighter… anything! When you are done drawing your character’s face, unfold the first section to the next blank section. Tuck the first section behind the second section. This part is MOST important: Pass your mystery Rolly Scrolly artwork to the person on your left. The person on your right should give you their hidden Rolly Scrolly artwork at the same time. Draw a fun shirt for the mystery character! Repeat the previous step once you have finished drawing the shirt section. Fold this section of the Rolly Scrolly Paper underneath the previous section, then pass onto your left neighbor. For the third section, draw pants, shorts, skirt, or a Superhero’s underwear! For the fourth and final section, draw legs and feet. Give your character sneakers, high heels or rain boots. Have fun experimenting! By this time, your Mix Up Rolly Scrolly character should make its way back again to you. When you receive it, unfold the sheet completely to reveal your hilarious character! P.S. Give your character a name once you’re finished drawing him/her! Try out this activity and show us what hilarious characters you and your students come up with! Send your photos to us! Contact us through the contact form. This entry was posted in Art and tagged art, art game, art teacher, arts and crafts, back to school, kids art, kids crafts, mix up art, rolly scrolly art, school art by roylcoblog. Bookmark the permalink. I’ve done this activity with students and they really enjoy it. I have found it’s better with students 7 and up rather than the younger ones. That’s because the older students put more details into the work. Thank you for noting this Franciful! Do you have some pictures to share of your students’ work? Would love to make a post on your success! I’d love to see your finished artwork! LOL this is really funny! I love the collaborative aspect. I agree! I’d love to post up some examples of how turns out in the classroom! So funny! I will try it with my students! Please don’t forget to take photos! I’d love to see how it turned out! !